You all know that my favorite earrings in the world are pearl earrings. They are timeless, classic pieces that will be fashionable forever. Pearls, unlike other materials, actually shine more and more with use. It is no surprise that I fell instantly in love with Dior's Tee Shirt Earrings as soon as they were launched. 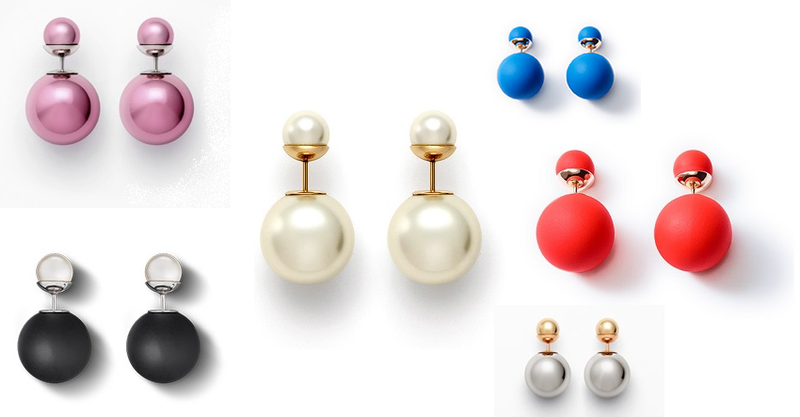 My favorite ones are obviously the pearl ones, but I also adore the playful colored ones. Too bad they are sold out in most stores around the world! Do you like them? Ustedes saben que mis aretes favoritos de todos los tiempos son los aretes de perlas. Son clásicos y no pasan de moda con el tiempo. Las perlas, a diferencia de otros materiales, brillan más con el uso. No es una sorpresa que me haya enamorado instantáneamente con los aretes Tee Shirt de Dior el minuto que salieron a la venta. Mis favoritos obviamente son los de perlas, aunque también me encantan los de color, especialmente los azules. El único problema es que están agotados en muchas tiendas alrededor del mundo. ¿Les gustan? I love pearl earrings too, and love that these come in all different pretty colors! I love pearls but I'm still undecided on these earrings. Me encanta esta moda, se puede hasta usar en un look no tan clásico y más rocker o grunge. Los negros son mis preferidos. Divino el post.